Welcome to Curling at The Maitland! The Members of Maitland Curling welcome you to our club. The club offers a range of curling opportunities for players of all skill levels. Whether you are a novice, intermediate or experienced competitive curler, we’re confident you’ll enjoy our facility, excellent ice and camaraderie. We invite you to explore the website to learn more. The Maitland Curling club is dedicated curling facility with four sheets of ice and a lounge and viewing area. We are located in Goderich, Ontario just off Highway 21. If you’ve ever wanted to try curling, you’re in the right place. 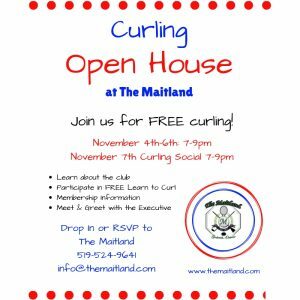 The Maitland Curling Club is hosting our 2018-19 Open House on November 4th-6th and our Social November 7th, from 7 to 9pm. Each night of Open House includes FREE Learn to Curl lessons, taught by our very own curling members. What’s more, our 2018-19 Curling dates are now available. Click here to learn more about the excitement at The Maitland’s Curling Club. We are always looking for new members, from beginner to seasoned players, to join us at The Maitland. This is your resource for all things Curling in Ontario. Check out their website for news, information, awards, programs, bonspiels and more!